A lonely strip of manmade snow visible on Diamond Peak Ski Area near Incline Village on November 29. 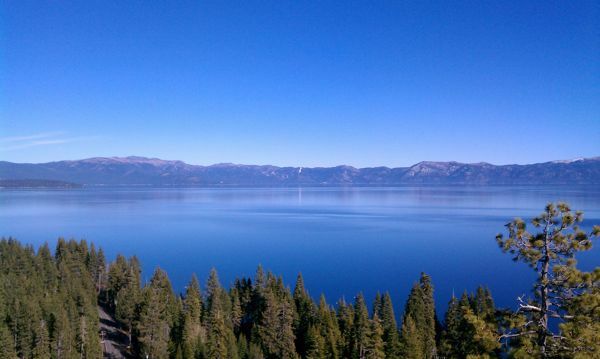 November 29 was dead calm on Lake Tahoe. It was a great day for paddleboarding or boating. Conditions will change radically today and tomorrow as a cold front moves in with very high winds but little or no precipitation. Thursday should be a nice day for surfing on the Lake. Long range forecasts look promising for the storm door to open around the middle of December. The beauty of living in Tahoe is that when the going gets good, we are right here to get it. The 1995-96 ski season had virtually no snow until mid January at which time a two week storm cycle rolled in and paved the way for an abundant and fruitful winter.